Tooth bonding can be used to fill in gaps that lie between a person's teeth (dentists call this type of gap a "diastema"). 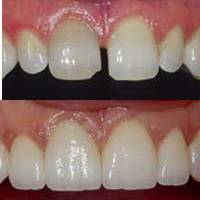 When this technique is employed, dental composite is bonded onto the sides of the two teeth that lie on either side of the gap, so to widen each tooth slightly. The net effect is that the space between the two teeth is narrowed, or even filled in completely. 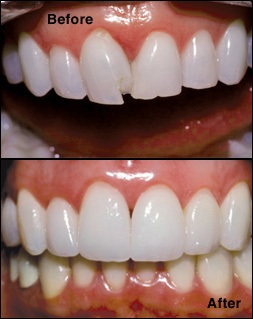 Dental composite (the restorative that is used with tooth bonding technique) comes in a wide range of different tooth shades, it will typically mimic the color of the tooth on which it is placed very closely. 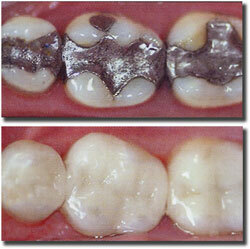 In some instances dental composite can be an appropriate restorative for fillings placed in back teeth. Patients often like this option because the white color of composite fillings is much less noticeable than the silver coloration of dental amalgam fillings. If your bite feels uneven, if you have persistent pain, or if you have any other questions or concerns, please call our office at (203) 272-9694.